Straps are great. I use one when I play ‘ukulele standing up. But, great as they are, the screws that are used for attaching the strap buttons can impose on your instrument. Before now there weren’t really any alternatives to drilling into your ‘ukulele to mount a strap, besides the classical “sound hole hook” style strap. But the Mobius ‘Ukulele Strap changes that. 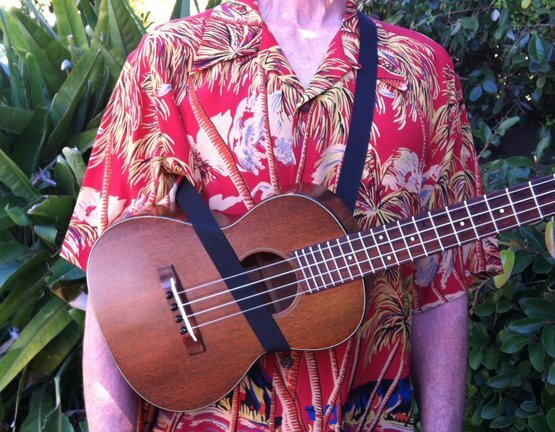 Thanks to a clever guy named Tim Mullins who saw potential in the brain-bender known as a mobius strip, ‘ukulele players now have a way to use a full shoulder strap without drilling holes in their instrument. Tim was kind enough to send me a demo to try. 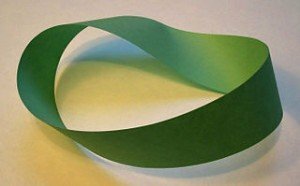 The mobius strip is the phenomenon that occurs when you undo a loop of paper and twist one end by half a turn and reattach it. The funny shape that results has only one side – if you were to trace a line on the loop with a pen you could return to the beginning of your ink without lifting the pen. The Mobius ‘Ukulele Strap uses the same concept to support the ‘ukulele without any twists along its path. An adjustable black nylon shoulder strap that doesn’t need any special hardware to use or install. An ‘ukulele with a “waist” is the only prerequisite. The nature of the Mobius Strap allows it to rest against the body of the ‘ukulele without any twists. 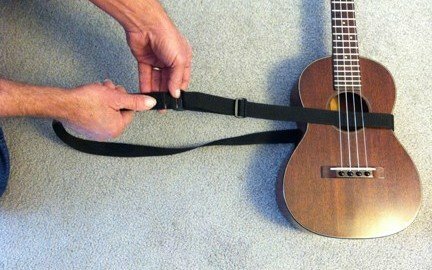 The strap goes under the strings, cradled in the waist, comes up the back of the ‘ukulele and then over your shoulder to attach via velcro to the other end. The design is simple. However, it took me a couple minutes of hard puzzling to figure out how to get it over my shoulder the right way. Once you put it on you can adjust the strap for optimum ‘ukulele support. Amazingly, with no hands on the instrument, the strap holds the neck up past horizontal – better than my normal guitar strap! The Mobius Strap is a solid little piece of equipment. It seems very well made. The velcro is sewn on and the plastic loops for adjusting length feel heavy duty. There’s not much to break. Playing with the Mobius is very comfortable. The nylon is very flexible and the mobius design means no twisted edges are ever present to scratch you. It supports the ‘ukulele very well. Whenever you let go of the neck, pressure from the crossover strap positioning is transfered to squeeze your torso gently. CORNY ALERT: It’s like getting a hug from your ‘ukulele! In most playing positions the Mobius ‘Ukulele Strap performs just as well or better than a traditional strap. You have to be a bit careful though, if you lift the ‘ukulele’s weight off the strap it can raise up under the strings and either mute them or make them buzz. (Of course as soon as I figured this out I was trying to use it to make steel drum noises.) This problem usually only arises when you sit down and rest the ‘ukulele on your leg higher than the strap is positioned. The strap could be wider across the back to spread the weight out a bit more. If you used the Mobius for a long time you might get a bit of back fatigue. The velcro surface area could be extended by another inch to make me feel really secure about jumping around onstage. UPDATE – 2/23/13: Tim recently updated the design of the Mobius strap to include some of my ideas. It now features black velcro that is 50% longer for more sticking power. He also increased the overall length of the strap to fit bigger ‘ukulele players. If I had an ‘ukulele without any strap buttons I would use a Mobius without hesitation. It is a simple, elegant solution to the “I don’t want to drill into my ‘ukulele” problem. Very, very well done. It’s free! Get monthly tips and updates right to your inbox. Mahalo! You have successfully subscribed to the Ukeletter! Made in Honoka’a, HI, brah.